Obama’s bus tour was a fraud. The buses were flown from stop to stop. Remember President Downgrade’s “Midwest Bus Tour” about jobs? Apparently he thought that the answer to high unemployment has nothing to do with all the uncertainty in the market right now. No, what we really needed was for POTUS to pack up TOTUS and hit the midwest for some more campaigning. Of course, the White House didn’t describe it as campaigning. They said it was a “listening” tour. To Barack Obama, “listening” apparently means speaking to crowds about how none of our economic problems are his fault, and placing the blame mainly on Republicans. He forgot to mention that for 2 years his party had complete control of the US Government, and was able to pass his stimulus bill. Ed Morrissey asks why they couldn’t have ordered buses made in this country. Why not use a manufacturer based in the US? I’m certain that Complete Coach Works in California could use the work, for instance, or North American Bus Industries in Alabama. Setra USA manufactures its buses in Greensboro, North Carolina, a key state that Obama could easily lose in 2012. Wouldn’t a $2.2 million buy there have turned a few heads? For that matter, Obama could have bought them from Motor Coach Industries and picked them up in his home state of Illinois at the start of his tour. 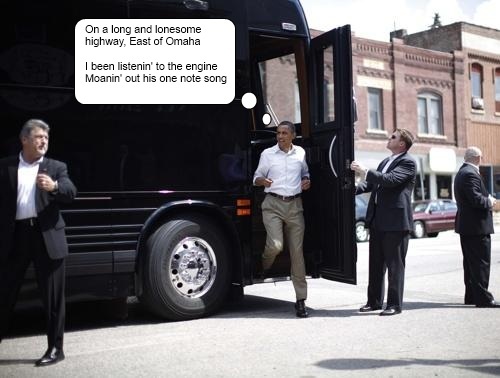 Why did Obama go on a bus tour anyway? He’s got Air Force 1. He can fly into wherever he wants to do his campaigning, er, I mean listening. White House press secretary Jay Carney explains. Ah. Well, that certainly makes sense, doesn’t it? The President wanted to go to smaller communities. Kinda nice. So he had his Canadian buses made so he could ride them in security from stop to stop. Except, he didn’t. He actually did fly AF1 from town to town, and even the buses were flown from town to town. Because you can’t get a 747 into those small communites, you know. Obama’s fake bus tour about jobs but without a jobs plan reminds me of his ridiculous Greek columns in Denver. He’s all about image, and very short on substance.